Siofok is one of the most beautiful towns at Lake Balaton. It is 105 kms from Budapest, accessible via the M7 motorway. 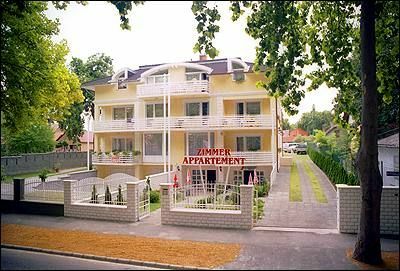 The 3 stars Apartment Bella is situated at Siófok-Aranypart, 150m far from the beach, port and citycenter at Battyhány Lajos utca 14/A. You can reach the Balaton-shore within a few minutes walk through the woody Jókai-park. The capital of Central-Europes biggest sweet-water lake - Siófok - provides you leisure and relax during the summertime and wintertime. 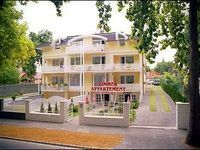 Despite the central situation our 3stars apartment-house is situated in a calm and peaceful surrounding. Places for the guests cars secured in the wellgroomed garden. The apartments, all with terrace, with different tidying and sizes one bedroom to three bedrooms, for 2 till 6 persons are there for you to make your own selection. All apartment equipped with French-bed, bathroom, well-equipped kitchenette or kitchen, refrigerator, Sat-TV, digital-phone and minibar. Breakfast is at our drinkbar on request. We organise with our sailboat excursions, angling up to 12 persons further on we provide all type of programs. We would be grateful to welcome You, as our guest. Looking forward to have your interests and reservation. • Breakfast is not included in room rates. It is available at 990 HUF per person. • Wireless Internet access is available in all rooms. • Pets are allowed, charges apply. • The hotel holds the rooms only until 18:00 without valid credit card details. • Reservations can be cancelled free of charge up to 7 days prior to arrival until 18:00. • Rates exclude tourist tax (400 HUF per person per night). • Payment is to be completed by cash. No credit cards are accepted.